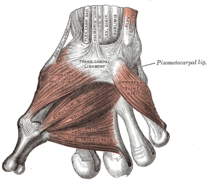 Bones of the thumb, visible at left. Any of the four terminal members of the hand, especially those other than the thumb. There is a variation in the angle between the first, second phalanges of the thumb of humans, varying between 0° and almost 90° when the thumb is extended in a "thumbs-up". It has been suggested that the variation is an autosomal recessive trait, called a "Hitchhiker's thumb", with homozygous carriers having an angle close to 90°. However this has been disputed, as the variation in thumb angle is continuous and shows little evidence of the bi-modality seen in recessive traits. Malformations of the thumb include a triphalangeal thumb and polydactyly. Thumb and index finger during pad-to-pad precision grasping. It is possible, though, that a more likely scenario may be that the specialized precision gripping hand (equipped with opposable thumb) of Homo habilis preceded walking, with the specialized adaptation of the spine, pelvis, and lower extremities preceding a more advanced hand. And, it is logical that a conservative, highly functional adaptation be followed by a series of more complex ones that complement it. With Homo habilis, an advanced grasping-capable hand was accompanied by facultative bipedalism, possibly implying, assuming a co-opted evolutionary relationship exists, that the latter resulted from the former as obligate bipedalism was yet to follow. Walking may have been a by-product of busy hands and not vice versa. The thumb is not opposable in all primates — some primates, such as the spider monkey and colobus, are virtually thumbless. 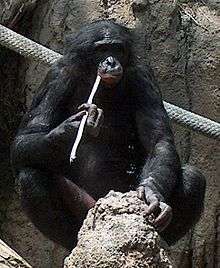 The spider monkey compensates for this by using the hairless part of its long, prehensile tail for grabbing objects. In apes and Old World monkeys, the thumbs can be rotated around its axis, but the extensive area of contact between the pulps of the thumb and index finger is a human characteristic. Darwinius masillae, an Eocene primate fossil often described as a missing link between prosimian and simian, had hands and feet with highly flexible digits featuring opposable thumbs and halluces. Almécija, S.; Moyà-Solà, S.; Alba, D. M. (2010). 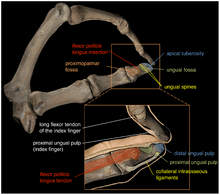 "Early Origin for Human-Like Precision Grasping: A Comparative Study of Pollical Distal Phalanges in Fossil Hominins". PLoS ONE. 5 (7): e11727. Bibcode:2010PLoSO...511727A. doi:10.1371/journal.pone.0011727. PMC 2908684 . PMID 20661444. Harcourt-Smith, W E H; Aiello, L C (May 2004). "Fossils, feet and the evolution of human bipedal locomotion". Journal of Anatomy. J Anat. 204 (5): 403–16. doi:10.1111/j.0021-8782.2004.00296.x. PMC 1571304 . PMID 15198703. Leakey, LSB; Tobias, PV; Napier, JR (April 1964). "A New Species of Genus Homo from Olduvai Gorge" (PDF). Nature. 4 (202): 7–9. Bibcode:1964Natur.202....7L. doi:10.1038/202007a0. PMID 14166722. Moyà-Solà, Salvador; Köhler, Meike; Rook, Lorenzo (January 5, 1999). "Evidence of hominid-like precision grip capability in the hand of the Miocene ape Oreopithecus" (PDF). PNAS. 96 (1): 313–317. Bibcode:1999PNAS...96..313M. doi:10.1073/pnas.96.1.313. PMC 15136 . PMID 9874815. Young, Richard W. (January 2003). 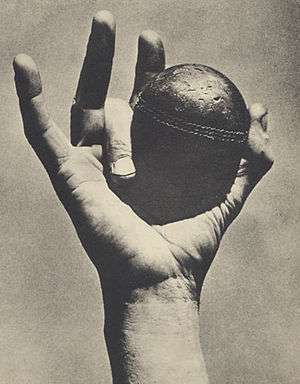 "Evolution of the human hand: the role of throwing and clubbing". Journal of Anatomy. 202 (1): 165–174. doi:10.1046/j.1469-7580.2003.00144.x. PMC 1571064 . PMID 12587931.